Even though you’re a grown woman, you’ll always be his little girl. In many ways, it was our fathers who helped us become the women we are today. Always there with advice —sometimes in the form of gentle words of wisdom and occasionally in the form of a stern lecture, we have learned a lot from our dads. With Father’s Day just around the corner on Sunday 16th June 2013, and your wedding day drawing closer, we’ve put together 5 loving ideas to say “thank you” to the man who taught you so much. It may be your wedding, but it’s dear old dad’s big day, too! From walking you down the aisle to the father and daughter dance, and every moment in between, your dad has been preparing for his special role for a long time. From the world of work to family life, it’s a wonder your dad had any time at all. But, somehow he managed to teach you to ride your bike, drive a car and a million other lessons both big and small. Remind him how much you value all the time he spent with you with this handsome Chrome Fold Up Alarm Clock. 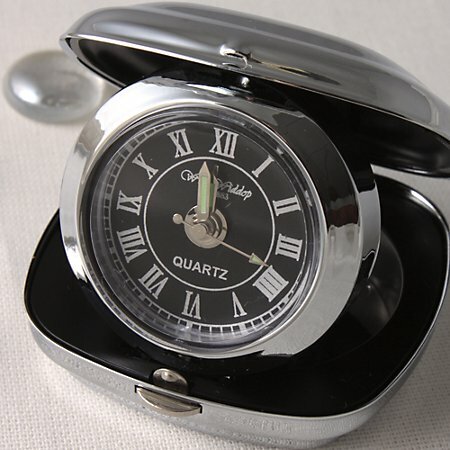 The old-school Roman numerals and take-anywhere compact design will make this a gift that lasts. If your dad is anything like ours, then one thing is for sure — he loves a classic. Classic tunes, a good whisky and a well-made pair of shoes are just a few of the things he taught you to appreciate. 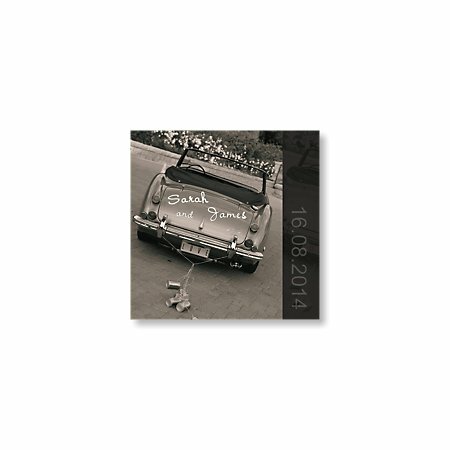 Choose this just married themed thank you card to jot down a heartfelt message for Father’s Day and we guarantee he’ll be sure to tuck it away some place special, so he can read his Classic Car Thank You Card. He’ll be giving his share of speeches and toasts on your big day. Help him raise his glass in style with this personalised Pewter Tankard.Engrave your dad’s name; feature your wedding date; and consider even writing a special toast to the father of the bride! 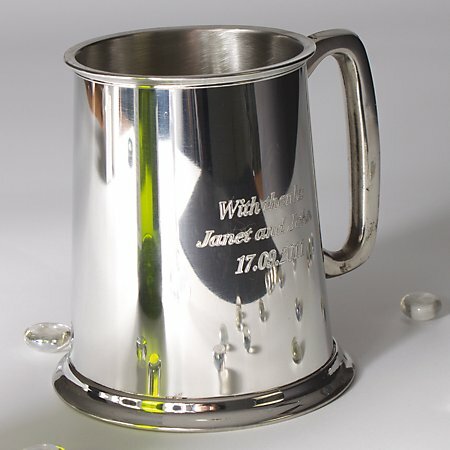 Take a look at Bride & Groom Direct’s collection of personalised tankard wedding gifts. Don’t fore-get to have fun! What is it about the men in our lives and golf? There must be a certain magic to the green and a power to the putter. Give your dad the fun and relaxation of golf off the course, too. 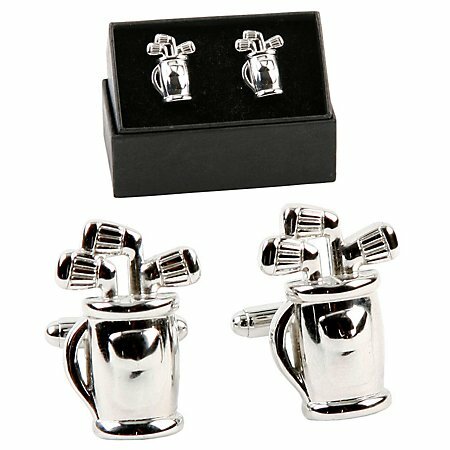 He’ll be happy to sport these Golf Bag Cufflinks as a token of his love for the sport, and of your love for him! He’ll love what you’ll choose for him from our wedding cufflinks for Dads. That’s just a small handpicked selection of thoughtful gifts your Dad could receive from you this Father’s Day. We’ve got plenty more exciting and original presents which are guaranteed to be affordable. 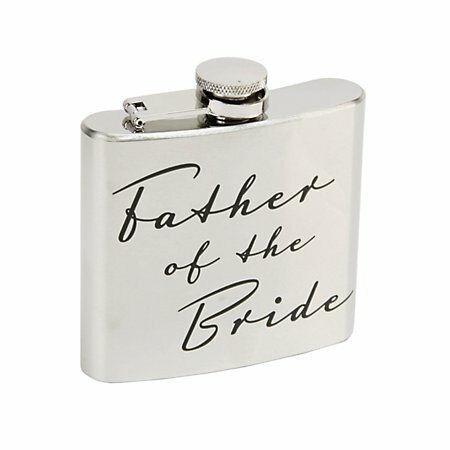 So don’t forget to find a keepsake your Dad will cherish in the wedding gifts for him collection.